I think almost everyone knows the scenario: You work on a Word document and either Word itself or the entire computer crashes. 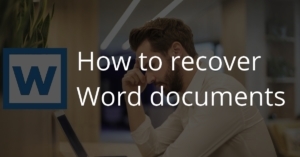 In order to prevent a total loss of the document, Word can activate the so-called “auto save” function, which saves the document automatically every X minutes. So in a crash only the changes since the last automatic save are lost. But what if you had not saved the document yet? In this case, Word does not automatically restore the document. But here, too, is one last salvation. We want to look at both tips in the following. 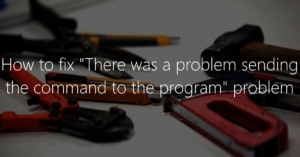 This article is about how to fix the annoying “There was problem sending the command to the program” error, which may occur in various Microsoft Office products. Yes, the title of this article is bulky – but it hits the core. This error can occur in various Office products such as Excel, Word or PowerPoint and shows as follows: For example if you try to open an Excel file by double-clicking the Excel application starts, but displays the error message instead of the file. However, opening the file from Excel via “File -> Open” still works. Insert page numbers in Word documents is a breeze. A click on the tab “Paste”, another on “Page Numbers” and then it is almost done. But if you want to configure only a little more than the orientation or font size of the page numbers, you get an serious problem. Then it suddenly did not seem so easy. If you want to start the page numbering, for example, from the third page, because for example the first two pages are occupied with the cover page and table of contents, you have to grab in the bag of tricks. How exactly to do this, if you want to let the page numbers in Word start from any given page, I’ll show you now.